I'm in the 'bacon camp' where I think food is better with bacon. Perhaps it's not exactly the most healthiest choice but I was willing to make an exception for my dinner party. 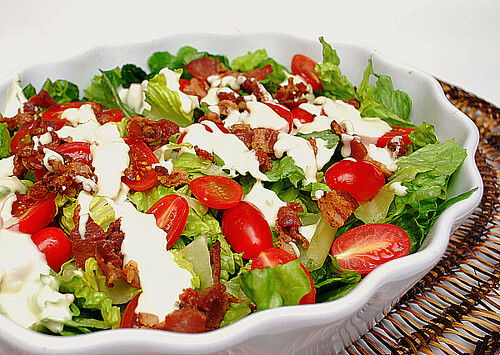 This salad is nothing more than bacon, lettuce and tomato but it's the creamy parmesan dressing that ties it together deliciously. In fact, the dressing was pretty easy to do with only a few ingredients that many may already have lurking in their fridge and pantry. 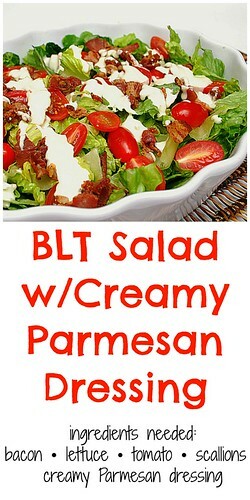 If you wanted to make this salad into a meal, throw in some grilled chicken breast, sliced steak or even shrimp! In a skillet, cook the bacon over medium heat until crisp, 6-8 minutes. Transfer to a paper towel-lined plate and break into pieces when cooled. In a small bowl, whisk together the oil, Parmesan, sour cream , vinegar, 2 tablespoons water. Season with salt and pepper to taste.